It will be here to support you, to stay with you for as long as you need. After all, that’s what we designed the Slope Saver® erosion control grass seed to do. And it looks great doing it. With its extensive root system, it will prevent erosion and slippage. It germinates quickly so it can get to work right away, attaching itself to the slope and holding everything together. 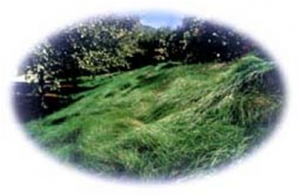 Slope Saver® erosion control grass seed can be grown in direct sun or in heavy shade. It can be mixed with a small percentage of wild flowers, and it requires little water so it’s effective even in drought areas. It can endure alkalinity, poor soil and moderate wear. Slope Saver® can also handle extremely high or low temperatures. Plus, it needs virtually no hand-labor or regular maintenance. The most attractive characteristic of the Slope Saver® is its appearance. It has a fine leaf texture that’s dark, blue-green and gray-green in color. And it beautifies any bare slope with its rich color and solid coverage. Slope Saver® erosion control grass seed also addresses the concerns of Fire Department officials. They recommend grasses more than wildflowers or shrubs, to create an attractive greenbelt that will remain green all year long (in southern climates) and prevent an excess of dead, organic matter that may ignite in an instant. Slope Saver® erosion control grass seed also has a lower growing height and contains no oils that can create and fuel flash fires.